A Peripherally Inserted Central Catheter (PICC line) is used in various cases when there is a need forprolonged vein access (e.g hemodialysis, long term antibiotic and chemotherapy, total parenteral nutrition etc.) PICC line can be used to measure CVP (Central Venous Pressure) which is a good indicator of a blood pressure inright atrium and vena cava. PICC line insertion has become a procedure of choice compared to the surgical placements of the central venous catheters. Usual sites for PICC line insertion are through cephalic, basilic and brachial veins (see image on the right) in the upper limb. Interventional radiologist inserts PICC line catheter through one of the veins and guides it through larger veins toward the heart. Greater precision is achieved by usage of ultrasound and fluoroscopy during the insertion. PICC line is generally left in place up to 30 days depending on the indication for insertion and the type of the catheter used. 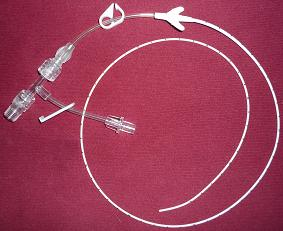 Removal of the PICC line is usually simple and can be done at the bedside. The insertion site is bandaged with sterile gauze and needs to be kept dry for a few days to help the healing of the wound. After removal of the catheter, the vein is preserved and can be used in future if needed.